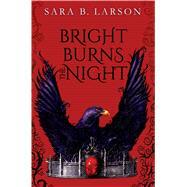 , by Larson, Sara B.
Sara B. Larson is the author of the acclaimed young adult fantasy Defy trilogy: Defy, Ignite, and Endure; and Dark Breaks the Dawn, the first book of a duology. She can't remember a time when she didn't write books -- although she now uses a computer instead of a Little Mermaid notebook. Sara lives in Utah with her husband and their children. When she's not mothering or writing, you can often find her at the gym repenting of her sugar addiction. You can visit her online at www.SaraBLarson.com.